Date: Wednesday, Apr. 10, 2019, from 6–9 p.m. CANCELED DUE TO WEATHER. Watch for a rescheduled date. Way back in 1986, before craft brewing was even cool, Summit Brewing Company Founder and President Mark Stutrud set out in St. Paul, Minnesota, to make craft beers inspired by old-world brewing traditions and ingredients. 32-plus years later, Summit Brewing Co. continues to infuse traditional recipes with modern ingredients from around the world, crafting high-quality and consistent craft beer out of respect for the hardworking folks who enjoy our beer. 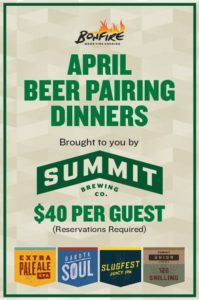 Join the Summit crew Wednesday, April 10, at Bonfire Wood Fire Cooking in Savage for a four-course beer dinner expertly paired with Summit brews, including the new Summit Slugfest Juicy IPA. Price is $40 per person. To reserve your spot, call Bonfire at 952-447-1122. For more information, including food and beer pairing info, please visit https://www.facebook.com/events/394596721337619/.